Political emergencies tend to be confections and propagations, puffed realities advanced by demagogues and figures of desperation. The issue of a Mexican emergency on the border has always been far-fetched, but last Friday, White House press secretary Sarah Sanders was insisting that there were 4,000 suspected or known terrorists who had been caught attempting to enter freedom’s land, with Mexico being the “most vulnerable point of entry”. Such a statement implied that Mexico was playing its own irresponsible part in ensuing this vulnerability to prosper. A qualifier was subsequently made by White House adviser Kellyanne Conway: the figures used in rather cavalier fashion by Sanders had been from 2017 for the whole set of attempted entrants. Trump has some latitude in redirecting military funds by a declaration of a formal emergency under the National Emergencies Act of 1976. The threshold is surprisingly low, a more than generous nod towards executive flexibility in determining what might constitute a state of sufficient disturbance. What matters from Trump’s perspective is showing how the border wall would fit into the category of a military fortification. While his judgement might well be challenged in court, the issue of standing for any opponents will be problematic. If he wants money for the wall how come his advisors have not suggested a GoFundMe appeal to his base? Remember Czechoslovakia in 1937?? These tactics look very like the very same tactics used by Hitler to bluff compliant British and other European governments scared of Communist takeover by the workers and loss of upper class privileges and property before, entering the Spanish Civil War and ultimately, the misjudged Polish Invasion of 1939. Dictators do not change their tactics, they only change the name to cause history to be written again. You know how independent these Americans are, anything that smacks of cooperation is the evil path to communism. Perhaps, Trump should demonstrate his independence and build the effing wall himself. Oh, I jest, Trump wouldn’t know one end of a shovel even if smashed over his head. And I am not suggesting violence to the POTUS. Obama was deporting 400,000 a year. If you dont think the USofA has a southern border problem you are not paying attention. Play your partisan games all you want but when the Democrats were talking about a wall no one paid much attention. This post reminds me of my customary view of New Year – that folly by which we convince ourselves that the mere arrival of a calendar date can effect sweeping change. The obese can become svelte; the dedicated smoker can restore their long lost lung function; the world will be a better place – all by some weird magic. Sadly, the truth is far more prosaic, if not plain frightening. The world is going to hell. I see lots of article trumpeting how graphs show that the world is a far better place that it has been in the past. Facts are undeniable, but the decline in the world is a more subtle phenomenon. We have less big conflicts, but more simmering conflicts and more countries racked by intenral conflict, often promoted by fossil fuel interests and corruption on a massive scale. Materialism continues to grip the western world. Sure, millions in China have been lifted out of poverty, but how does that explain how there are still too many kids in urban Australia go to school each day without a decent breakfast? Where pensioners have to wait years to see a specliaist in the Australian public health system, but those same specilialists are, typically, multi-millionaires. We have allowed our politics to diminish – in a 24/7 world where communication is dominated by drivel and, gulp, opinion dominates fact, our politicians have adapted to become sloganeers. But this means two things – one is that every act of every politicians is now made public and that turns politicis into a deadly reality TV show. Trump is the finest exponent, but only because his ego is so vast and his neediness simply unbounded. The second is that the calibre of election politicians has declined. It was never high, but how can an inarticulate, jibbering fool like Hanson get a public voice – and line her pockets at taxpayer expense because of the (past) vagaries of the electoral funding system. How do we tolerate the Duttons? How did we allow a fool who was a failed pre-selection candidate (until the other candidate was emeshed in scandal) and a weasel-word talking dolt to gain the office of PM – one for which he is patently unsuited and so obviously out of his depth? How do we complain about fuel prices and then overwhelmingly choose to buy ever bigger cars and how do we fall for the advertising of cars that festers our need to be looked at, admired and envied. We want bigger houses and scream about higher house prices. We scream about electricity prices but buy more and more appliances and bigger TV’s and fridges. The latest ad for the Toyota Kluger proclaims the car is “made to be looked at”. The latest ad for a Holden SUV says “don’t just turn up … arrive”. Be special, promote your personal brand, your opinion matters, your utter specialness requires unique products so the world can look rapturously at you and want to be like you. This doesn’t point me to a world that isn’t being subsumed by greed, selfishness and self-obsession – and Trump is at the vanguard of this deluded and needy movement and the “great big wall” embodies all that is flawed about Trump and much of the world. The “Mexican problem” is that Mexico is there and really Texas, New MEXICO, Arizona, and California are part of Mexico. That problem will always be there – wall or no wall. The Democrats are talking about border security in the broader sense. That includes border patrols [land and air], border crossing security upgrade and importantly coastal surveillance AND beefing up the wall. 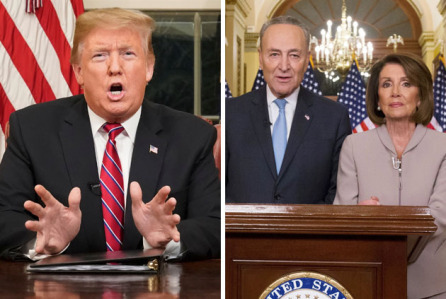 The Dems want to separate the two issues of the five billion for the wall from the general appropriations that run government services : Trump wants a fight, he has said so. I’ll give you points Terrance for acknowledging there is a problem which is more than most here will do but you still fall into the same trap. Report yourself as illegal and Immigration will send a bus to take all the rellies back to Mexico for a wedding. (Cheech and Chong, Up In Smoke if memory serves me correctly). But he could mobilise a mob of shovellers(some kind of 45 to top up numbers7??) to do a moat? Fill it with green dye so the wetbacks can be identified? I think the timing of the “wall emergency” is too suspiciously close to the fake Syria withdrawal announcement. Generally when American domestic politics is occupied with something super dumb, which is almost always, you can bet they are dropping more bombs from drones in some part of the Middle east. The wall and the war withdrawal are two fake election promises that Trump has to be seen to be trying to deliver. Its pointless reading any more into it. And feel free to substitute Obama, Clinton, Bush …it makes zero difference who is the mouthpiece: the US military keeps growing and killing exponentially. it is a sad thing to see that the US government is forcing people to work for free during the shutdown while increasing and funding an even bigger military to fight its endless wars. The US is in late stage Orwellian reality hence the ultimate doublespeak president. Trump was chosen for this exact reason and if you pay attention to the US congress voting record you will find that Dems routinely and almost unanimously vote for all things military including illegal invasions, no fly zones, sanctions and increasing the military budget, including Bernie and Elizabeth Warren. There is no “left” in America only one united War Party. Sadly this pattern is repeated here in Australia and I fear that we are not too far behind the US in our willingness to turn a blind eye. Already we have a booming arms industry. How did peace loving Australia get to here? How can we call ourselves free when we allow our governments to kill millions of nameless people overseas for secret political reasons? The end result will be that eventually governments will have permission to turn on their own citizens. Its already happening via the police force. Orwell was so accurate in predicting our fate because it was already happening in his own time. Ah, Trump, the denialist extraordinaire, l’enfant terrible. Didn’t he start by promising to build a wall using other people’s money? A mere progression of his tried and failed business model, where he successfully took his obscene inheritance and whittled it away through various bankruptcies, propped up decreasingly by his ‘art of the deal’ idiocy. When the Mexican’s said ‘No’, he said ‘Well we’ll build it and send you the bill’. Then he said it won’t be a wall, but a segmented steel fence. In Scummo style, he will likely build one section and photoshop it to inflate its presence. What they will probably get is a picket fence, or a series of sand bags. Like most of the planet at the moment, the people of America suffer for the inanity of their ‘leaders’. They too rely on crowd funding to paper over their own governments inadequacy. The success of the pages is limited, possibly due to the number of them. One would be entitled to ask why this fool hasn’t tried a ‘gofundme’ page to get his white picket fence built, a fund he could contribute to. Oh, that’s right. They have a gofundme page, to which neither he nor his unemployed rusted on supporters (still waiting for the promised return of their manufacturing jobs) have contributed. Well, they have a start, anyway. The existential clear and present danger, the national emergency, does exist in America. As many have noted, it occupies the White House, secure behind its very own steel fence. That it is the corruption and excesses of the governments on both sides of the border fuelling the problem is left ignored. Maybe Kim Jong-un could toss in a few bob. Or Putin. Thank you Dr Kampmark and commenters. Take care. Good reads… Yep, our depressing but inevitable slide into an Orwellian feudalism. By all means let’s vote in Shorty’s Centre Right Party ‘cos that gang will be less vicious and destructive than the LNP mobsters. But dont pretend we will save the environment, slow down the murderous military machine or restrain corporate rapaciousness. Apart from an airbrushing and some spackfiller it will be business as usual…. and we all know it. The USA doesn’t even make the grade as a full democracy. In link below, a chart lists order of level of democratic governance for the world’s nations, the USA sits at number 25 between Estonia and Cabo Verde. Australia is at number 9. Obama deported nearly 3,000,000. The southern Border is a real problem and the Democrats are just playing politics. 5 billion is nothing and if it helped solved the problem it would be a very cheap solution. Of course 5 billion won’t cover it. Trump campaigned on the issue and wants to be seen doing something ie to have a win. The Democrats don’t want that and they will do almost anything – like falsely blaming Russia or in this case mocking the sort of wall that has been built elsewhere to solve a problem. Like so much of modern politics it is no more than political theatre. Trump is becoming ever more lunatic and crazed. Frightening. He’ll blame everyone else if it all falls, again, into a dirty big hole of his own creation. You know what planes can do? More people arrive by plane and overstay visas than arrive via trekking across southern border. Bluddy Farce is more like it. “We’ll all be rooned” said Hanrahan. Seriously, though, this whole migration issue is descending into a tragicofarce, created to distract from more serious matters of malfaesance and misgovernment – of which there is and endless supply, it seems. Let us not forget this entire safety of our borders beat up, is part of the justification for spending on defence weaponry soon to become redundant by the time the subs, jet fighters and other big boys’ toys arrive on site, at taxpayers expense. What’s the latest on Hakeem Al Araibi, still in Thailand…? Now in Canada. Welcomed at the Airport by the Foreign Affairs Minister(?). Those Canadians know how to make decisions. Now if she wanted to be an au pair … too easy. MN, I know Rahaf Al Quinn was snapped up by Trudeau, I was referring to the footballer, Hakeem al Araibi…( we like sports people)….. Sorry helvityni soccer players fly well under my radar. Why was a political refugee so silly as to go to Thailand for a trip? Corruption from top to bottom. Not a nice place to be in very overcrowded jails. Overstayed once – but escaped with a fine. Never again. The Land of Smiles – except when they don’t. Last i heard was our Minister for Keeping Foreigners in Their Place Malice Pain was during the rounds of Bangkok restaurant kitchens on a best curry quest for her Dear Leader. Hakeem was informed that his football skills weren’t of a Socceroo level so he won’t be offered citizenship of Ozstraya. His lawyers have advised him to confess to a drug importation charge. The media, book and film deals will support his family and he can look forward to a comfortable life in a Thai prison. Everyone’s a winner. MN et Paul, serious subject matters, but you two have me laughing out loud…many thanks, I needed that.. Confused about the wall. Then this WON’T help. Is it really true that Mr al Araibi was detained by Thai police on a tip off from Australian Feral Police who advised them that a redflagged bad boy was in transit? There is a niff about the military expenditures which has a similar odour to the Murray/Darling at the moment. “Game of Mates” writ loud. The Donald’s “blunt warnings” about anything are a joke! If John “Bomb ’em back to the Stone Age” Bolton had issued the warning then I would be concerned. His hair is more frightening than any threats he shits…ah…tweets out.